Team McGladrey Member Zach Johnson announced this week that he won’t be playing in the Ballantine’s Championship in South Korea as originally planned. (This would have been Zach’s first time playing overseas in more than two years.) In place of the Ballantine tournament, however, Zach has committed to play at the Wells Fargo Championship. While we’re sure golf fans in South Korea will miss seeing Zach there, there’s no doubt that this decision will make our McGladrey team in Charlotte very happy! Do you plan to attend the Wells Fargo Championship? Who will you be pulling for to take home the trophy? PGA TOUR players are hitting the course today at the Zurich Classic in New Orleans. Team McGladrey Member Chris DiMarco is in group #46 which tees off at 1 p.m.. Good luck, Chris! 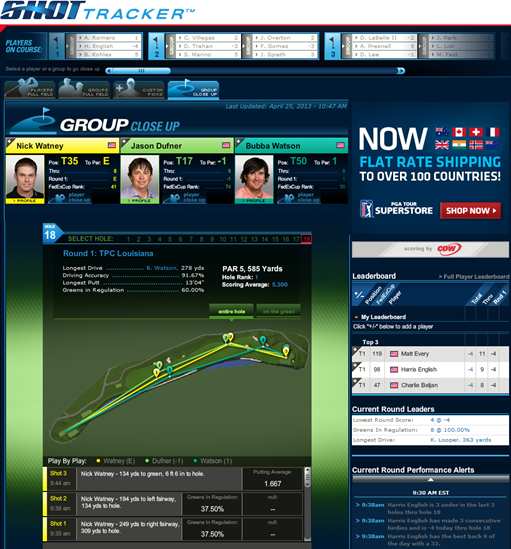 For those who can’t make it to the course, but might be following via their computers, be sure to check out the PGA TOUR’s Shot Tracker. The image to the left is a snap shot of what you’ll see. This morning Team McGladrey Member Davis Love III was the topic of discussion for ‘Morning Drive’ on The Golf Channel. Hosts of ‘Morning Drive’ discussed which part of Davis’ game they would take for themselves. Check out the clip here. With May right around the corner, it’s getting close to the time for new volunteers to register for the 2013 McGladrey Classic (Nov. 4-10)! While returning volunteers were given an opportunity to sign up early again this year, registration opens for ALL interested volunteers next Wed., May 1! New volunteers will be able to register for remaining volunteer spots and, for those who might be a little “late to the party,” add their names to the volunteer waiting list. Volunteer assignments are made on a first-come, first-serve basis, so you don’t want to wait too long to sign up! Find out more information here. Our volunteers play a BIG role in the success of The McGladrey Classic. As a small way of thanking them, the tournament regularly spotlights selected volunteers online. This month, it’s the Rusmans who are, by far, the tournament’s longest travelled volunteers, joining us all the way from Guernsey! Find out more on the Rusmans and how they started volunteering at The McGladrey Classic. Finally, taking place next Sat., May 4, is Demo Day Fore Charity. This will be your chance to experience what the pros experience at the state-of-the-art Learning Center Practice Facility at Sea Island Golf Club. We HIGHLY recommend checking this out if you will be in or around St. Simon’s Island. You can register here. You’ve got the moves like… Zach Johnson’s caddie! McGladrey Heading to The Masters!